Discussion in 'Civ3 - Succession Games' started by Doc Tsiolkovski, Sep 30, 2004. Interest: in the AWE. Signup: not before we are far into DocT5. How to conquer a large world with legions only. How to conquer a large world with legions only - redone on emperor. I do want to try rise and rule. However, all I have done so far is install it. Really not up to a variant of a variant at this time. I suspect there are several people out there like myself simply looking for a straight RaR game. Lee, you mean something like Demigod, standard mapsize, RaR-typical Civ, for 'experienced' players, but RaR Newbies? If there is interest, I can surely provide a playable map + helpful (hopefully... ) comments, but won't necessarily participate myself. I would be interested in the "Modern War" game...agree there is usually far to less room for extended modern warfare and the special rules sounds interesting.I guess difficulty would be Emperor or Demigod? Note I'm deliberately hiding the file here, since I don't want to get flooded with too many 'How do I install' etc questions, expecting everyone coming here has some basic knowledge about the Civ file structure. Unzip it, and manually put all files into the corresponding directories; replace existing files, add new folders etc. I'd better abstain from using 'unzip to...'; this may cause folders to be replaced. Go to the Firaxis Inquisitor folder (in your \\Conquest\Art\Units directory), and copy all files in that folder into the new RAR Priest animation folder. Go to the Firaxis Longship folder (in your \\Conquests\Conquests\Middle Ages\Art\Units directory), and copy all files in that folder into the new RAR Longboat folder. For more details, see the changelog.txt file (more than one hundred changes total ). Edit: As of 04/12/07, quite some RaR SGs have been played in 1.04, and a considerable number of other users seem to have downloaded this patch also. And, it looks like everything is working well. So, if you've found the way here - forget the entire section about swapping the txt files, unless you need to complete a 1.03 game before. Wow, I forgot this thread existed. Sorry 'bout not showing up for the RaR succession game. If I do the Pediacon swap things work fine. 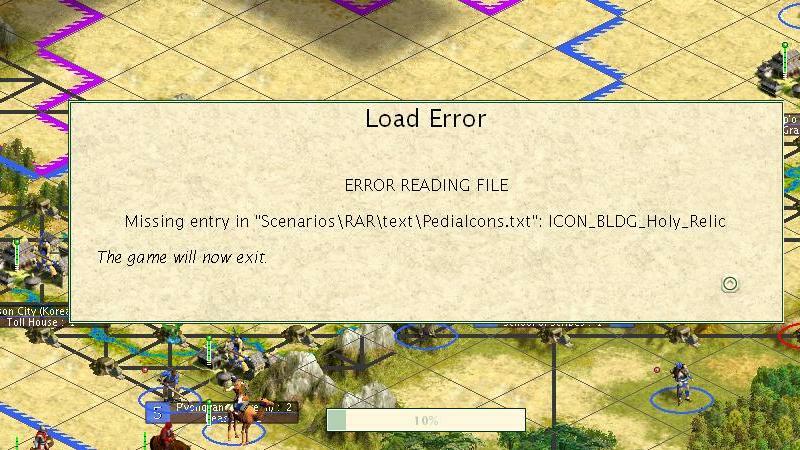 However, trying to load a pre 1.04 game results in the below. This seems outside of Inconvenience #3 that I did put the fix in place for. That's weird. You get that with the 'old' pediaicons.txt file? I get that with the 1.04 version if I try to load a 1.03 game. No problem if I swap out the pediaicons everytime I swap versions, but if I have the 1.04 version in, and load a 1.03, I get the same error LK does. Avatar is my American political hero and courtesy of Mistfit. Sorry . Seems like you indeed need to swap the txt file everytime then. My bad. Just installed it, all looks good. Thanks for that Doc. Had a read of the changelog, Hospitals look very, very attractive now. Good to see the media buildings made useful too. This version of the 104 pediaicons should work with earlier games. Please replace your version, if needed. What's the easiest way to get this mod? Should I download the 1.02 (120MB) install, and then patch with 1.04prebeta? Edit: sorry...meant to post this in the RaR thread. Edit2: I figured it out. seems we now need to manually rename the pediaicons.txt file whenever we swap from 1.03 to 1.04 and vice versa. Well, once those 1.03 games have ended, it isn't an issue any longer. I haven't had any problems with the Doc's Fix. I actually sat down and couldn't get up and played 1.04 for 6 straight hours today. It was the first time in almost a year that food was missed due to civ. Got it working, looks great.